Anchor “DREAM” 8 kg 1. The length of 215 mm. 2. trend diameter of 290 mm. 3. 50 mm diameter spindle. 4. The weight of the anchor 8 kg. The breaking load of the safety rope is 150 kg. Anchor “DREAM” 5 kg 1. The length of 215 mm. 2. trend diameter of 220 mm. 3. 50 mm diameter spindle. 4. The weight of the anchor 5 kg. The breaking load of the safety rope is 150 kg. FOLDING GRAPNEL WITH SPOON FLUKES Hot galvanised steel. A grapnel usually has four arms, sometimes folding for easier stowage. Grapnels can be used as the main anchor on small craft, canoes and fishing boats, but may also serve as secondary mooring anchors on larger vessels. 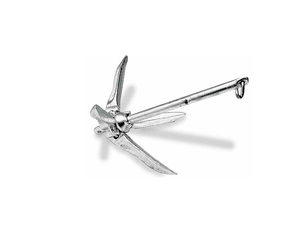 The grapnel shape allows the anchor to dig in regardless of its orientation when it touches the bottom. Its relatively light weight makes it easy to handle, but it can become snagged among rocks and coral because of its shape. A buoyed trip line attached to the crown should be used to free it. Vessel size will determine the choice of grapnel and anchor line.